A two hour bus trip south from Sai Gon and you could be on another planet. You’ll find yourself on quiet country back roads and tracks skirting the edges of winding creeks and fields of rice, observing the activity at markets alongside canals, and breathing clean air all the way to near Xeo Quyt. Xeo Quyt was the heart of the Viet Cong resistance to the U.S. and her allies in Dong Thap Province during the American War (1963-75). We’ll need to take ferries to get to the area of the former Xeo Quyt base, which lies under the canopy of a huge cajuput forest. 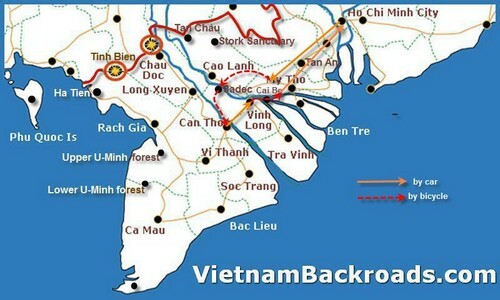 From there a former Viet Cong soldier who was stationed there will take us by rowboat to see the actual base and its small tunnel network, and relate the story of his and his comrades’ time there as we consider the sacrifices made, before heading off for lunch. Then it’s back on the bikes for more scenic touring, ending up in Cao Lanh Town, where we’ll take refreshments, dinner and a well-earned sleep..
Get some carbs in at breakfast for the ferry ride across the Mekong, and then the ride through plantation after plantation of ornamental flowers, to Sa Dec, one of the last remnants of old Indochina in Viet Nam, still displaying it’s French architectural heritage in French-built villas along the canal. There’s a really old Chinese temple there too, if that’s your thing, and some amazing brick kilns (really!). We’ll have lunch here before heading off through more wonderfully scenic country, see flower growers tending their gardens, with more rice fields and sweet potato plantations as we approach Can Tho, the ‘capital’ of the delta region, where we will have dinner and stay the night. It would be nice if we could choose the food for breakfast, lunch, dinner with our guide and have them with him. I wanted to eat breakfast and dinner at local restaurants, markets, not in hotels. Dat- the guide and Toan- the driver were fantastic! They really made us enjoy our time. Dat was incredibly knowledgeable and took great care of us. The only problem was the trip went too fast! Thank you for the trip of life time. We won't forget this experience any time soon.